Cut a slit in each date and open the two sides up like a book. Remove the pit and replace with an almond and apricot slice. Close up and set aside. 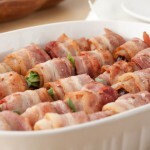 Cook strips of bacon on medium-low heat until fully cooked. You don’t want to over cook them or else you wont be able to roll them! 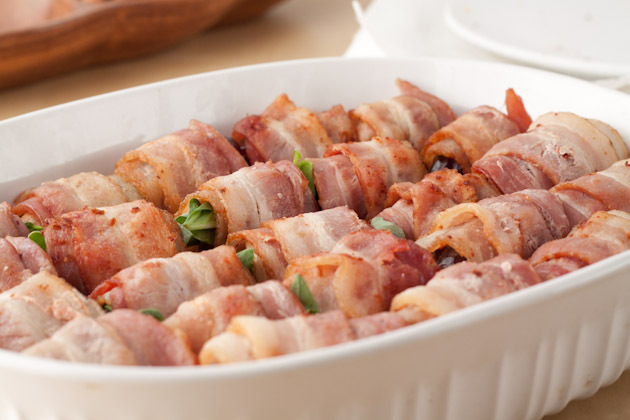 Place the stuffed date on the thicker end of the strip of bacon and roll until the seam of the bacon is at the bottom of the roll. I like using the thicker strip at the beginning so the roll looks nicer. Place seam side down in a casserole dish and bake in the oven for 10 minutes. To make ahead of time: Complete up to step 4, cover and refrigerate for up to 2 days until ready to eat.